Knightingale Reviews: Blog Tour: What They Don't Know by Nicole Maggi -- Author Interview + Giveaway! 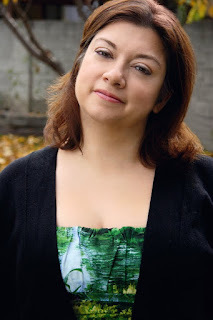 Blog Tour: What They Don't Know by Nicole Maggi -- Author Interview + Giveaway! Lise stands up -- and speaks out -- for what she believes in. And when she notices Mellie acting strangely, she gets caught up in trying to save her...all while trying to protect her own secret. One that might be the key to helping Mellie. 1) Do your characters’ stories ever reflect experiences you’ve had in real life? Yes. But not so much in What They Don’t Know. I’d say my Twin Willows Trilogy has the most personal experiences in it, because the main character’s mother in that series was based on my Italian grandmother and so much of my Italian upbringing was woven into the main character’s daily life. Though it wasn’t based on personal experience, there is a scene in What They Don’t Know where Mellie, who finds herself pregnant after being raped, goes to a “pregnancy crisis center.” These “fake abortion clinics” have been in the news a lot lately. They’re run by anti-choice organizations and lean very heavily on coercing women not to terminate their pregnancies. Mellie’s experience in the clinic is based on real accounts I read from women who visited these clinics, seeking help and medical care. Everything that happens to Mellie in that scene - from being forced to undergo an ultrasound, being given baby clothes, and not being allowed to leave - happened to someone in the research that I did. 2) Are you friends with any authors? If so, have they ever influenced your work or helped you to become a better author? I’m friends with many, many authors. I’m so fortunate that where I live, in Los Angeles, the YA author community is vast and wonderfully supportive. We’re all showing up at each other’s launch parties, meeting up for drinks, and organizing panels with each other. So many of these authors have been such a huge help to me; not to just my writing, but to my emotional well-being as a writer! But the writer who has been the most helpful is Romina Garber (author of the Zodiac series under the name Romina Russell). Years ago she posted a Craig’s List ad to start a critique group. I answered the ad, and an amazing friendship was born. We often joke that we’re twin brains because we think so much alike. We did have a critique group for a while; it’s since disbanded but Romina and I still meet up once a week to write together, and we’re always bouncing ideas off each other. I honestly don’t know what I’d do without her! 3) Is there a specific book genre that you prefer to write within, such as paranormal, contemporary, or thriller? Although What They Don’t Know is contemporary YA, I actually prefer writing paranormal or fantasy, and historical. It’s what I loved reading when I was growing up, and it’s still what I prefer to read. I actually don’t read a ton of contemporary fiction. I just like being able to escape into a totally made-up world, whether it’s my own or another author’s. Writing What They Don’t Know was a hugely rewarding experience, and incredibly enriching. I learned a lot about myself while I was writing it. But when I finished it, I realized that I really missed writing fantasy, and I think that’s what my next project will be. 4) Why did you choose to write stories for a young adult demographic? My first novel (which remains unpublished) wasn’t written as YA, but when my agent sent it around to editors, we got a lot of feedback that it felt like YA. This was just at the beginning of the Twilight craze, at the dawn of this Golden Age of YA that we’re in now. So she encouraged me to try writing YA for my next book. When I started writing in a teen voice, it felt like coming home. It took me right back to all those books that I’d loved when I was growing up: Tamora Pierce, Judy Blume, Lois Lowry. I love writing for an audience that is still figuring out their place in the world, at a time when they’re starting to think about their own beliefs and values separately from their parents’. Being able to reach teens at this powerful time in their lives is incredibly gratifying and humbling. 5) Are there any books that had a significant impact on your writing? When I plot out a book, I usually use the Hero’s Journey as my template, and no one is a better master at that than JK Rowling with Harry Potter. Not only does each book of the series fit into the template, but the entire 7-book series fits into it too. I really looked to her character journey arcs when I was writing my Twin Willows Trilogy. 6) What is your favorite quote? I think it’s so easy to be consumed by fear, and allow ourselves to be smaller than we are. Especially for women, who are taught from a very early age that we shouldn’t be too big, too loud, too successful, or too good at anything. When I’m feeling like that, like I don’t deserve happiness or success, I remind myself of this quote. There are two prizes up for grabs! 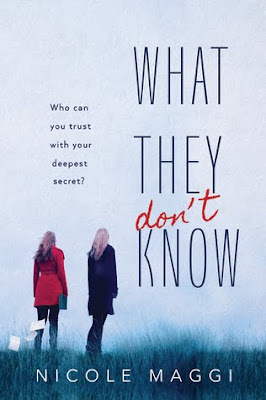 Two winners will each win one (1) copy of What They Don’t Know by Nicole Maggi. The giveaway will run from October 2nd to October 12th and, unfortunately, is US only.